When I think of eating traditional Italian food, typically my expectations aren’t too high. Immediately I contemplate how much I’m willing to spend on a flight to Italy, just to know that I’ll be getting an authentic Italian meal. Then, there’s Il Ritorno, located in St. Petersburg. Making the trip from Orlando, I was a bit anxious to see what I was in store for – and if I was making a two hour trek, I was hoping for out-of-this-world Italian cuisine. And what I got was beyond satisfying. Perched, almost hidden, on one of the busy St. Petersburg streets, it lies. The restaurant is small, but absolutely beautiful – brick walls, comfy couches with deep red pillows and dim lighting – a setting that lends a romantic evening or a relaxing night out with friends. The lighting is dim, but not too much to see the menu, which was displayed as very chic file folders. The menus are also printed daily, so that they reflect the latest menu items and fresh ingredients. On the other side of the restaurant from where we were seated, a small, beautiful bar sat displaying a very nice wine and beer selection, followed by light bites to start, main courses, and desserts filled the pages. To my surprise, Executive Chef and Owner, David Benstock, had a five-course tasting menu waiting for my sister and I. I brought my sister along for dinner (which she STILL thanks me very graciously for). David and his wife, Erica, opened Il Ritorno to bring a new take on Italian to downtown St. Pete. I ordered a Bellini to start, which paired really nicely with the bread we were given before our first course. I wasn’t sure what to expect from the five-course tasting menu, but the atmosphere and the way people all around us seemed to really be enjoying their meals, gave me a good feeling. Then Chef David introduced himself and his first course – a Blue Point Oyster with Smoked Trout Roe, Charred Leaks, Crème, and Micro Sorel. Honestly, I am not a big seafood fan. And oysters are definitely not something I even want to try. But this had to be one of the most delicious things I have ever tasted. This was the perfect pallet cleanser to start the meal. Shortly after, course number two, a Caprese salad arrived. The salad, which included ripe heirloom tomatoes, 10 year aged balsamic and basil oil, was so delicious that I ordered another one to take home for later for my sister. If you’re looking for another way to start your meal, a few other options include steamed mussels, asparagus soup, octopus puttanesca, and a cheese and charcuterie platter that pairs perfectly with a nice glass of wine. It was getting a little later now and the tables were starting to fill. A nice table in the back, reserved for parties, was holding a group of laughing men who seemed to be enjoying their time together. The restaurant seemed to illuminate a bit as it got darker out. A few minutes passed and our waitress, who was very attentive, brought us the next dish – torched cobia with crispy brussel leaves, smoked sea salt, lemon oil, and pickled shishitos. Another seafood dish. This time I wasn’t as nervous, because the flavor was absolutely incredible. Next it was time to try what I had been anticipating the entire night – the short rib mezzaluna, one of Il Ritorno’s best-selling dishes. This is what Italian food is supposed to taste like! 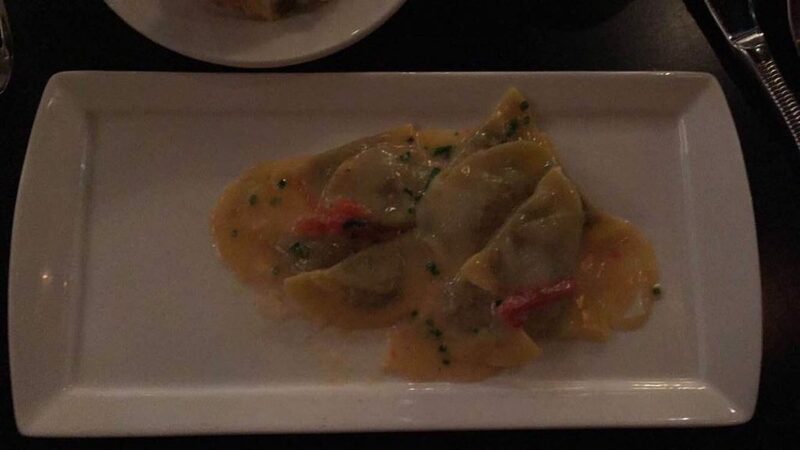 The mezzaluna, featuring truffle fonduta, concentrate tomatoes, and pecorino, was so good I was convinced myself it was the best dish of the night. 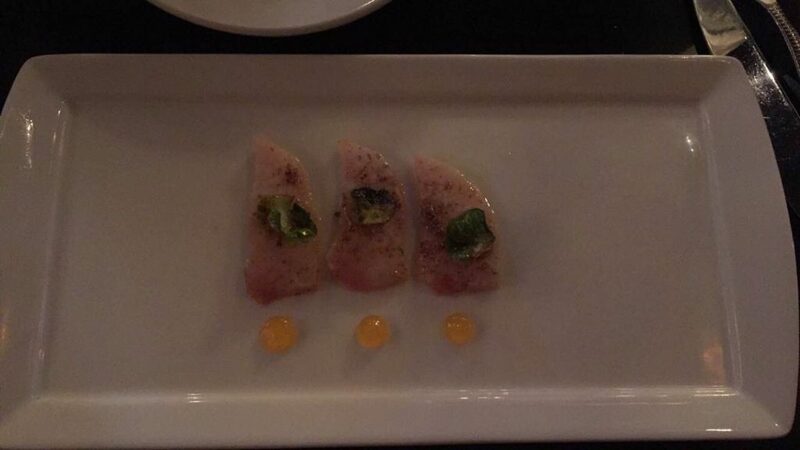 Until I tasted the seared tuna. 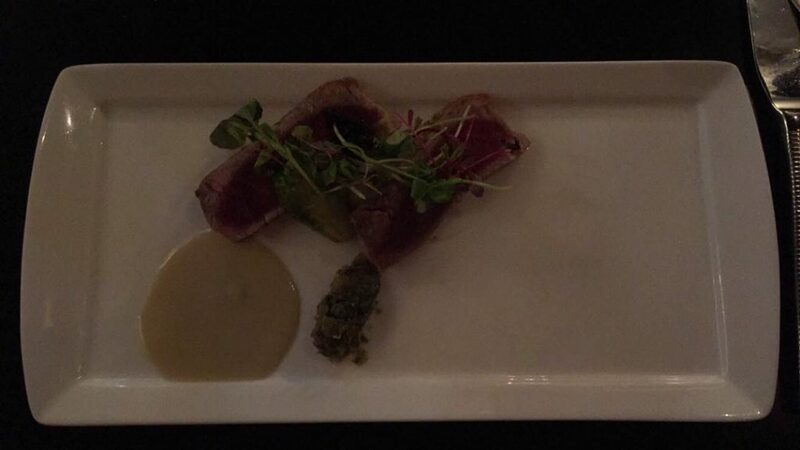 The tonato sauce that accompanied the dish paired perfectly with the tuna. I just had to fork up a bit of the sauce on each bite. Add in artichokes, charred pearl onions, roasted cauliflower, and caper tapenade and you’ve got a dish that’s absolutely to die for! 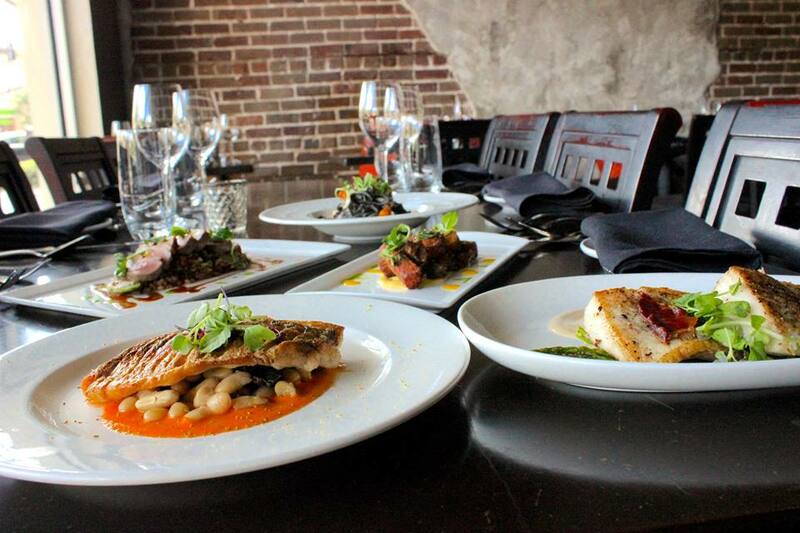 A few other excellent entrée items include smoked spring ramp risotto, pepper cavatelli, prime ribeye, and more. I was starting to get a little full until I saw the next dish being placed in front of me – the apple fritter. This dessert embodied everything I love in dessert. I’m typically not a chocolate lover and most fruity custards and puddings aren’t my thing. But this was maple cinnamon gelato, salted caramel, and cinnamon candied pecans all on top of a perfect slice of fresh, crisp apple. This dessert was the perfect way to end a fantastic meal. I’m already planning to take my sister back for her birthday this month. If you’re looking to take a chance on some really good Italian food, or need a new spot for a romantic night out to dinner, give Il Ritorno a shot. Hey, I drove two hours, and it was worth every mile.